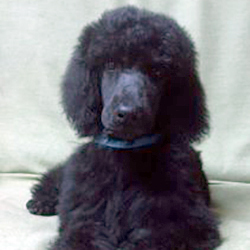 We often have request for Trained Poodles. We know the time and energy that goes into proper training of a puppy. 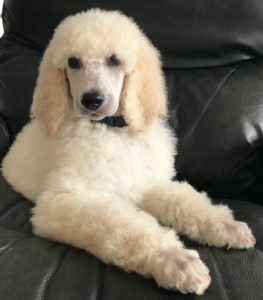 So even though we have a training program that you may enter your puppy in before coming to you, we, at times, have young Trained Poodles available for adoption in proper homes. 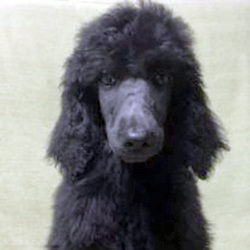 Most people who request Trained Poodles appreciate that proper puppy development is crucial for a well balanced canine without behavioral problems. 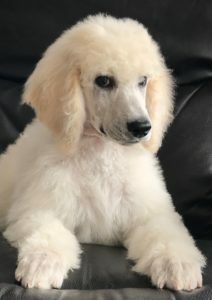 Here at Poodle Mojo training starts at day one and continues until the puppy is placed in its new home. Parsley is in training. This includes not just Basic Commands like Sit, Stay, Down, Off, but house training, crate training, lead training and both canine and humans socialization. Parsley is a very loving boy. He is very in tune with his surroundings. Thyme is in training. This includes not just Basic Commands like Sit, Stay, Down, Off, but house training, crate training and lead training and both canine and humans socialization. Thyme is a very smart boy. He loves to see what is going on. He is very aware of his sibs and humans. He is gentle, loving and just loves everyone. Ebony is a very loving boy with a clownish side. He loves playing and engaging his sibs and humans in his play. He is smart and willing to learn. He is in the Basic Training Program. He is already sleeping through the night. Raven is a very loving girl. She learns fast. Before she was put in her official training program she would ace her pre-training. She is eager to learn and always want to please. We see her going far. She is a larger girl. She already sleeps through the night. Click to go to her page. Expresso is a delightful guy. He is loving and sweet while being fun to be around. He sleeps through the night. He is quickly learning all his Basic Commands. He loves both his people and his canine friends. He is a beautiful boy both in appearance and personality. ALL our puppies start out in the Basic Training Program. Please refer to our Professional Training from Us page for all the Basic Commands we teach. We also teach our puppies to walk on a lead. This will have them ready for walking on a leash. The lead is always an important training tool. Once the Puppy has mastered the Basic Training Program we will then advance them into their next phase. We pull on their strengths and continue working with them in their weak areas. 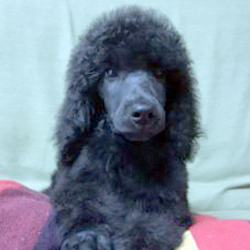 Poodles are smart and training is a must and a delight to see these little ones eagerly learn all about living with their humans. Pricing depends on their training program. They all will have Basic Training, however, some will have more Advance training. If a puppy only has Basic Training and you would like more Advance Training this can be arranged. Price will be set after we have discussed where you want the Puppy training to be advanced to.